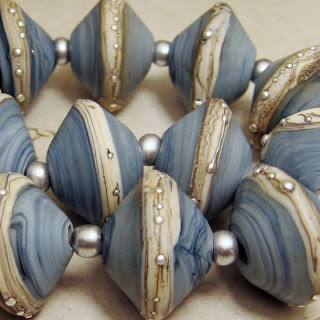 There's a new and exciting new blog from fellow lampwork artist Holly Dare. It's called Glass Beads Daily Several lampwork artists are already involved, showing different beads everyday with links to their shop. 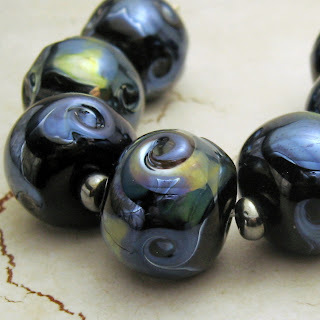 Holly has come up with some themes too, like Blue Monday where all the beads are blue! 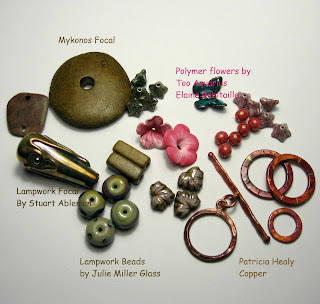 Be sure to check it out and if you're a lampwork artist, get involved! It's a great way to bring traffic to your shop. Jewelry Stringing magazine is hosting their annual Bead Star competition. The deadline for entries is Friday, May 24. I would love to see my lampwork beads in a winning entry! Speaking from past experience, take the best photos you can, even if you have to have someone else photograph your pieces. You can have up to 5 photos for each entry this year. They have totally changed the rules, for the better! There is over $4000.00 in cash prizes this year! There is also an Emerging Artist category, so if you have never had your work published before, now is the time to strut your stuff!! There is a fee to enter this year too, but I think it makes people take it more seriously. The judging is handled by the staff of Jewelry Stringing and Beadwork magazines, not by popular vote....much better. I'm off to photograph my two entries! Pinterest can be very addicting! Although I'm not one of those addicts, I find some very beautiful inspiration there for my beads. 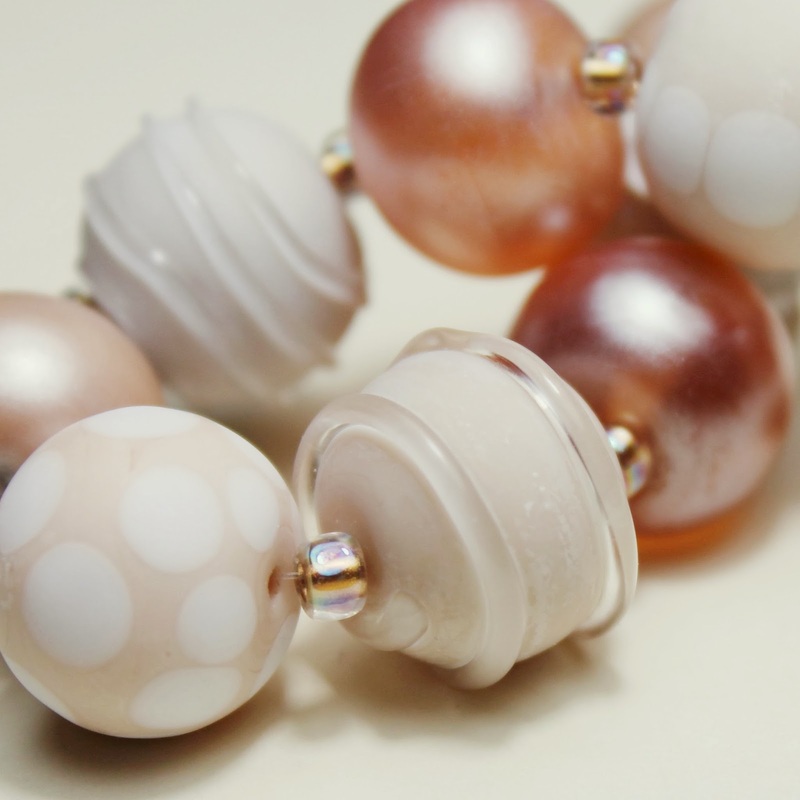 I've created a Pinterest board featuring jewelry made by my customers using my beads in the designs. If you would like to be invited to Pin on this board, just leave a comment in the section below with your email. If you don't feel comfortable leaving your email on a public site, just contact me through my Etsy shop and I'll add you! 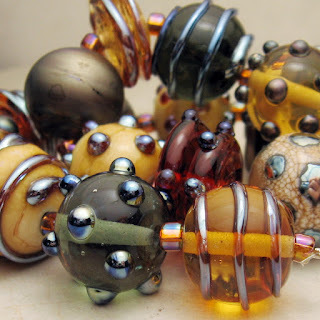 A new blog site has opened up in the last couple weeks that features daily lampwork bead posts by lampwork glass bead artists. It's called Glass Beads Daily Be sure to check in often as artists post different beads everyday. Here's a little eye candy of mine! I often have leftover beads after making a set, so I was inspired to make this bracelet and earrings set with a few "leftovers".I just love this denim color. It pairs well with silver or copper and is very popular right now. 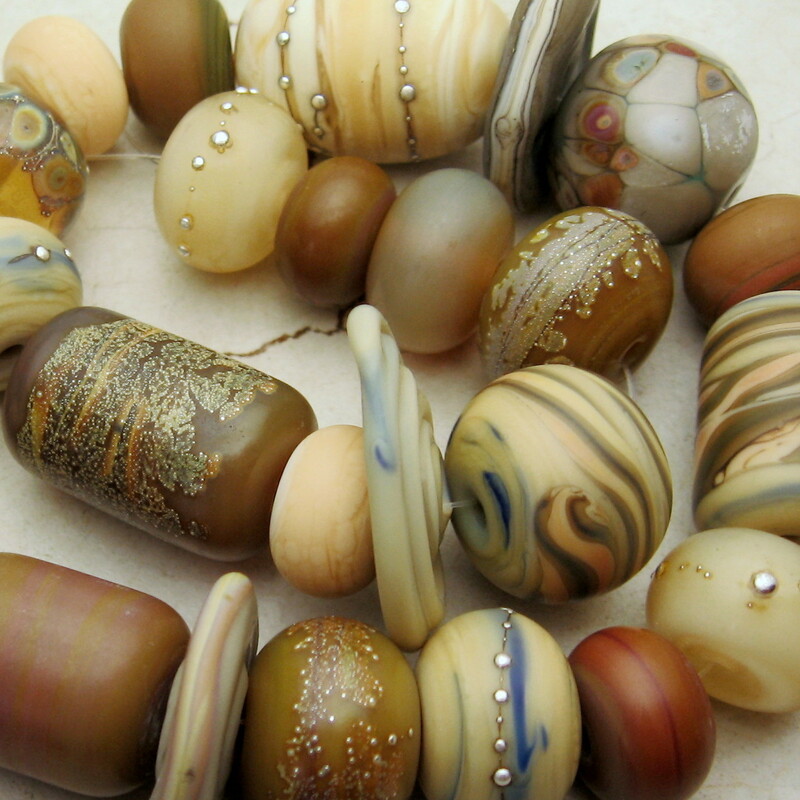 Balancing the beads aesthetically and physically is always a challenge when you are working with odd shape beads. Just remember your design basics, line, balance, rhythm, movement, pattern and color. Sorry for the iphone photo! 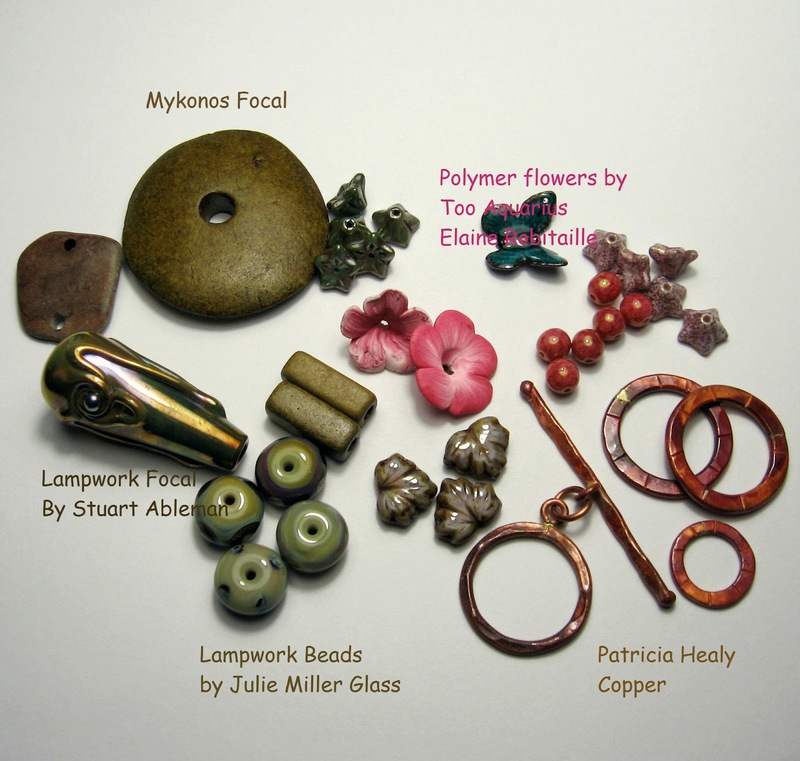 It's time for Lori Anderson's annual Bead Soup Blog Party 7! I have a great and talented partner, Rain Hannah of Honey and Ollie. Here's a link to great Etsy shop. 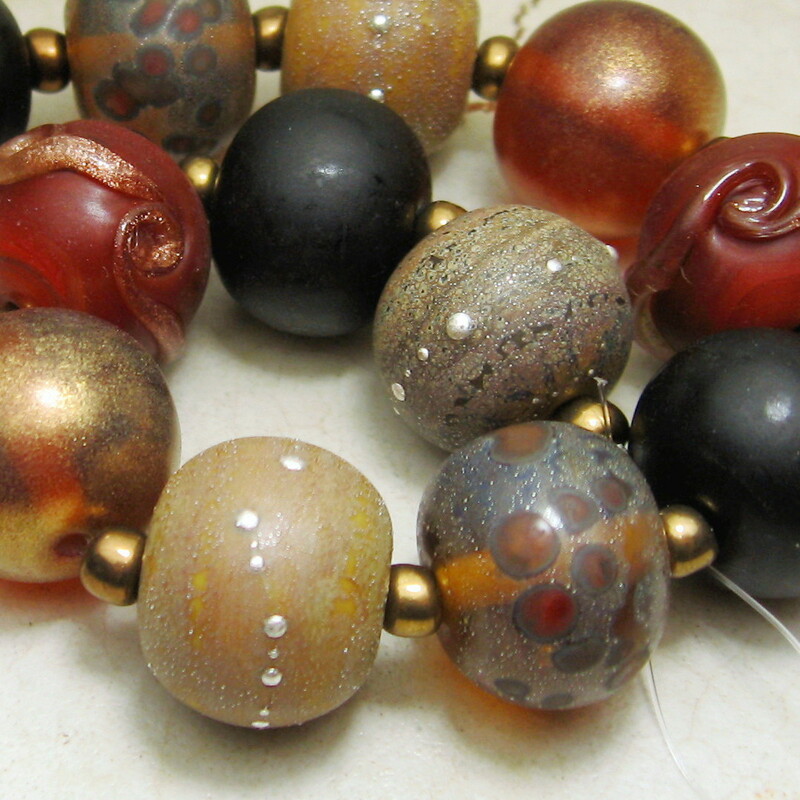 http://www.etsy.com/shop/honeyandollie?ref=search_shop_redirect I recieved my bead soup and it has so much inspiration! I'm thinking at least 2 designs from all that. Our reveal date is March 30, 2013. 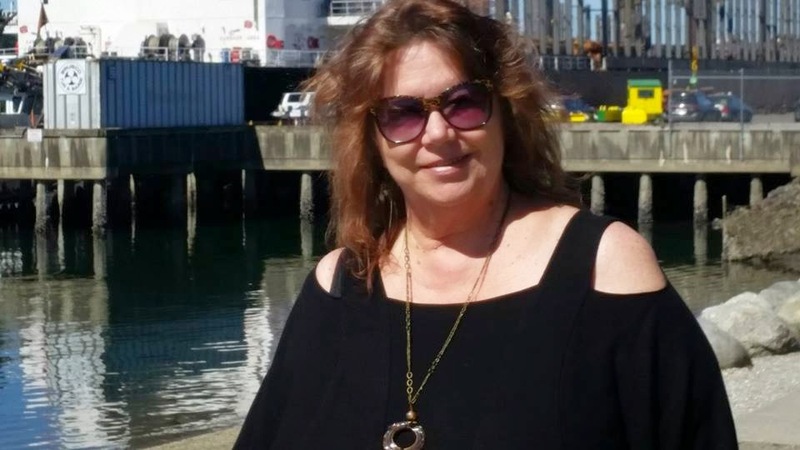 So with 500 participants this year, Lori divided it into 3 reveal dates. Lots of blogging going on! After reading alot of blog posts in the recent blog hop, I decided to change the look of my blog. What do you think? I still can't get the lettering on the right hand side to change color..but I guess it looks okay. I think it will make a better background for my beads and not so hard to look at as the black! I've been busy working on a trunk show for my niece and sister-in-law's bead store, but I'm done now so will be posting lots of new beads this week...especially now that the weather has warmed up a few degrees, I can work out in my studio without freezing!